CINCINNATI - The Kroger Co. is building a restaurant into its newest Marketplace store on U.S. 42 in Union, Kentucky. Kroger officials declined to comment on the venture, but a sign on the front door of said it will begin serving lunch, dinner and Sunday brunch in October. Kroger has a dozen different jobs listed on its website for Kitchen 1883, including wait staff, bar employees, cooks and dishwashers. The company is hosting a job fair Thursday, Sept. 7 at the Comfort Suites hotel at 5905 Merchant Street in Florence. Kroger CEO Rodney McMullen has been signaling the company’s eagerness to compete in the $1.5 trillion U.S. food industry, which includes not only grocery stores but also bars and restaurants. That’s why Kroger is experimenting with meal kits and in-store bars and seating areas, where customers can grab lunch or meet friends for a drink. McMullen told Wall Street analysts in March that he’s been pleasantly surprised by how willing Kroger customers are to eat in the store. “That will be an opportunity to grow the business,” he said. Kroger has some in-house expertise for starting a new restaurant concept. Paul Sturkey was a celebrated local chef when he launched his Encore Cafe concept in Wyoming in the late 1990s. Ebony magazine called him one of the nation's top African American chefs. While the restaurants faded, Sturkey's line of gourmet salad dressings survived. Sturkey left the restaurant business to work for U.S. Foods in 2011, then joined Kroger in March 2016 as a product and project development chef. 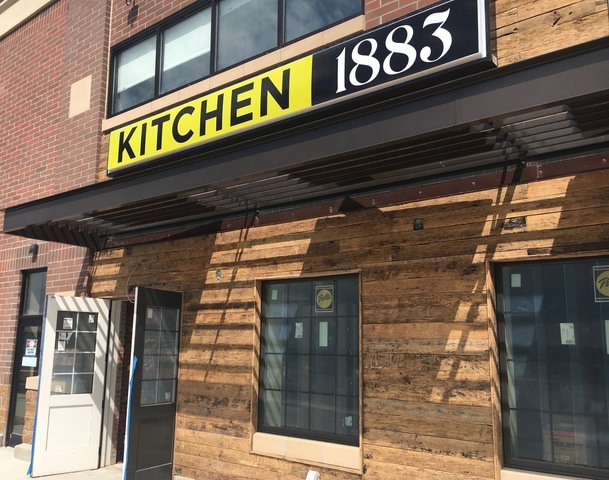 The Kitchen 1883 concept gets its name from the year that Barney Kroger opened his first grocery store in Cincinnati. Kroger has used the date on steak sauce in the past, but this is the first time it’s been applied to a full-service restaurant. Kitchen 1883 has a small space, about the size of a strip-center Subway shop, with windows facing the Kroger Marketplace store interior and entrances from the store and parking lot. 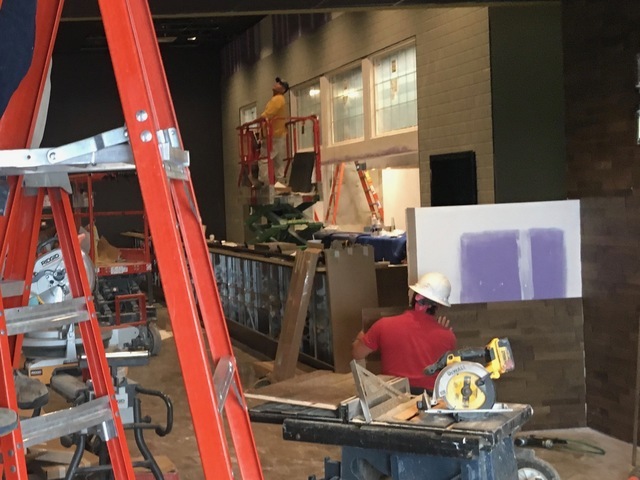 Construction crews were installing stone and glass finishes this week, including a bar at which patrons can get an open view of the kitchen. Bishop said other grocery retailers are experimenting with in-store restaurants to capitalize on a trend toward eating away from home. But Bishop also thinks in-store restaurants are a defensive strategy against the rapid expansion of home-delivery services, which online rivals are using to sell meal kits, restaurant meals and deliver beer and wine to consumers in an hour or less.